Measures of organic matter processing have been proposed as indices of stream ecosystem function. However, to be meaningful for ecosystem management, functional responses must be informed by knowledge of multiple stressors in the face of global change. In streams and rivers draining agricultural catchments, deposited fine sediment and elevated nutrient concentrations represent two important land-use stressors commonly associated with degraded ecological conditions that can interact in complex ways to affect ecosystem structure and function. If or how climate-change induced warming will interact with these other stressors is largely unknown, but of potential concern is whether increased temperature will interact with existing or impending stressors to create ecological surprises in the form of synergisms (amplified effects) or antagonisms (reduced effects), in comparison to what would be expected based on knowledge of individual effects. In this multiple-stressor study, we investigated how deposited fine sediment and elevated nutrient concentrations (at levels found in streams draining highly intensified agricultural catchments in New Zealand) interact to affect organic matter decay rates along a temperature gradient encompassing the forecast scale of climate-change induced warming in New Zealand of up to 5.1°C by 2090. 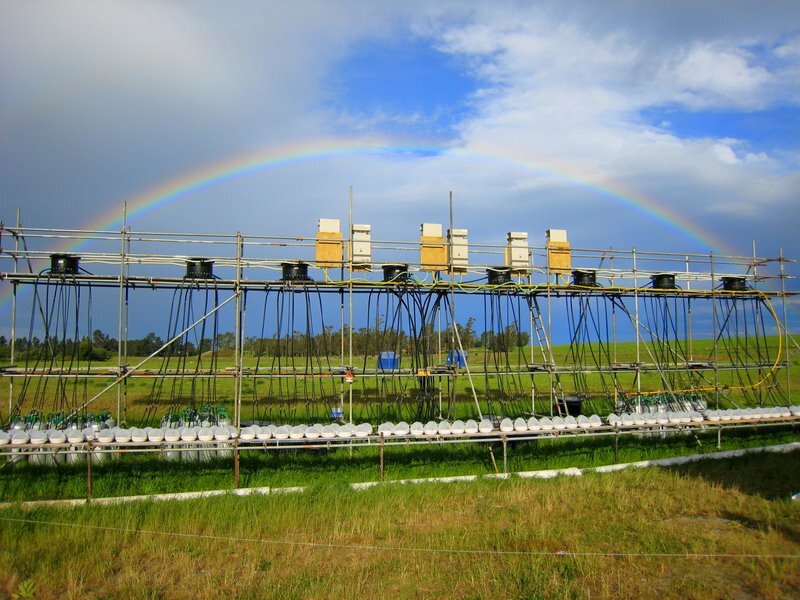 To our knowledge, this experiment represents the first to study stream decomposition processes by manipulating two agricultural stressors individually and in combination along a gradient of simulated climate warming. The ExStream System in New Zealand, an innovative field research facility offering strict control of experimental variables, excellent statistical power and a high degree of realism (e.g. permitting natural immigration and emigration of stream organisms). Two ExStream Systems have been established in New Zealand and Germany (since 2013), with a third planned for Japan in 2016. 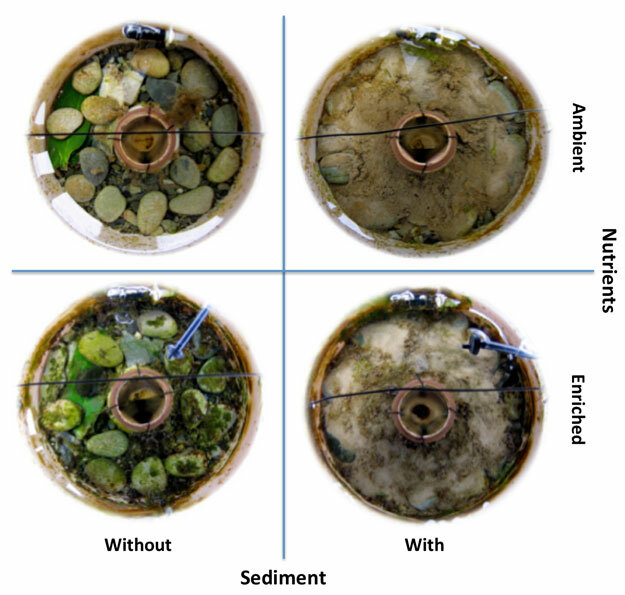 Utilising a highly realistic outdoor experimental stream mesocosm system (ExStream System; see image above), we manipulated nutrient concentrations (two levels), fine sediment (two levels) and water temperature (eight levels, 0–6°C above ambient) in 128 streamside mesocosms (see image below) to determine the individual and combined effects of the three stressors on decomposition rates of fresh and pre-dried leaf packs and cotton strips. Photo of circular stream mesocosms on Day 10 of the manipulative period by nutrient and sediment treatments. Inflow jets creating clock-wise flow are visible at the top and outflow drift capture nets are visible in the centre of each mesocosm. Nutrient enrichment drippers are visible in enriched mesocosms and green leafpacks are visible in mesocosms without added sediment. Our results showed the preeminent influence of temperature and the interactions among stressors affecting decomposition processes. Sediment greatly increased decay rates of fresh (living) leaves, but not of dried leaves or cotton strips. Thus, leaf condition can strongly affect decomposition processes, with important consequences for streams that naturally receive freshly fallen leaves and have high sediment loads. Non-linear responses of decomposition to rising temperature highlight how a warming climate may alter organic matter processing in complex ways. Our finding that dried leaf biomass loss responded positively to nutrient enrichment but not sediment addition, whilst fresh leaf biomass loss responded positively to sediment addition but not nutrient enrichment, suggests the two measures may offer complementary information in the functional assessment of multiple stressors in streams. This study’s findings complement our related findings for periphyton and macroinvertebrate responses from the same experiment. Collectively, these findings demonstrate how the magnitude and complexity of interactions between climate and agricultural stressors are manifested or suppressed among trophic levels (producers, consumers and decomposers) and levels of biological organization (individuals, populations, communities and ecosystems) with important implications for our understanding and management of freshwaters in the face of global change. More information about the authors’ research and the ExStream System (incl. a 20min podcast) can be found at http://tinyurl.com/radionz-exstream. Next Next post: What is the future of soil carbon stocks?